Use this book to develop a system for marketing in your company. Stop chasing ideas and learn to market with success. Plus, you’ll learn what to do with all those great marketing ideas you (and others) have for your business. Genius! Marketing is based on a system that has helped companies successfully market their products and services for over 20 years. This field-tested process will change the way you think about, and more importantly, how you plan and execute marketing. Genius! Marketing is for anyone who is ready to get off the marketing merry-go-round of chasing ideas and the latest marketing trends and develop an effective marketing system. 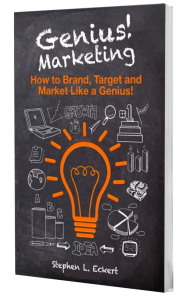 This book will show you how to develop marketing processes that will drive sales. Contact us to learn more.